Mediated by Chris Rudd, founder of ChiByDesign, and Sarah Coulter, Executive Director of the Calumet Collaborative, this forum will discuss the future of residential abandoned properties and vacant lands in the Calumet region. In a panel discussion, experts will explore if the introduction of new technologies and emerging financial services could empower local residents to reactivate abandoned residential properties and vacant land in the Calumet region. Prototypes being designed by graduate level students will serve as the reference point to surface future implications of impact at scale, considering new opportunities in the Calumet region. Jasmine Gunn works as a project manager at Claretian Associates, a community development organization located in the South Chicago community. Her role includes developing affordable housing, community buildings and supporting other quality of life programs. Jasmine’s areas of interest are community and economic development, equity and social justice.Jasmine is a graduate of the Master of Urban Planning and Policy Program at the University of Illinois at Chicago (UIC). While attending UIC, Jasmine was the president of the Society of Black Urban Planners and worked as a research assistant at the Nathalie P. Voorhees Center for Neighborhood and Community Improvement. Jasmine was also awarded the American Institute of Certified Planners (AICP) 2018 Outstanding Planning Student Award. Additionally, She holds a professional bachelor’s degree in architecture from Iowa State University. Khari Matthew Humphries serves as the Senior Manager of Community Life for The Community Builders, Inc. whose mission to build and sustain strong communities where people of all income can achieve their full potential, work he has been doing for over 7 years. He leads Community Life which uses mixed-income and affordable housing as a platform to ensure an increased quality of life for the residents and neighborhood in which they serve specifically in the areas of asset building & financial education, youth development, education, senior services and community leadership. Khari serves as a leader and resource connector both in his organization and community. Mila K. Marshall leads efforts in Policy, Analysis and Research. She provides technical and analytical leadership for Delta Institute’s strategic priority areas through translating data into action. She brings to Delta a diverse perspective with her interdisciplinary background and affinity for novel solutions anchored in equity. Mila completed her Bachelors of Environmental Biology at Chicago State University with dual minors in Chemistry and Geography and is currently completing her Ph.D in Ecology and Evolutionary Biology at the University of Illinois at Chicago. The Sustainable Solutions Workshop is a graduate-level course offered by ID. 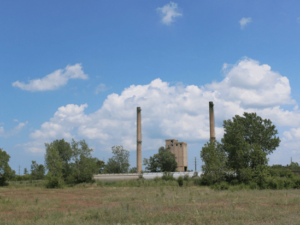 Students are working to support Calumet Collaborative with the design of potential interventions that could enable sustainable systems solutions, with the focus on residential abandoned properties and vacant lands in the Calumet region.